The NEW Canada’s Food Guide is here! Today, Federal Minister of Health, Ginette Petitapas Taylor launched the new Canada’s Food Guide. The new Food Guide takes a modern approach to communicating guidance to consumers, health professionals and policy makers. This first suite of resources includes a document Canada’s Dietary Guidelines for Health Professionals and Policy Makers, as well as a Food Guide Snapshot. 1. Positive key messages for Canadians in a modern format. Key messages are: Eat well. Live well. Eat a variety of healthy foods each day. The new Food Guide delivers healthy eating information in a mobile-friendly web application. 2. Beyond food. Healthy eating is more than the foods you eat. The new Food Guide offers advice on what to eat, what not to eat, and how to eat. Tips include cooking more often, eating meals with others, being mindful of your eating habits, enjoying your food, limiting foods high in sodium, sugars or saturated fat, using food labels, and being aware of food marketing. 3. Food groupings instead of food groups. Bye bye rainbow and the four food groups. A healthy meal is comprised of a variety of foods from three key food groupings: vegetables and fruit; whole grains; and protein foods. These foods should be consumed regularly. 4. Proportions not portions. There are no recommended servings to eat or serving sizes of food. A plate snapshot of the Food Guide gives at-a-glance information on what to eat. 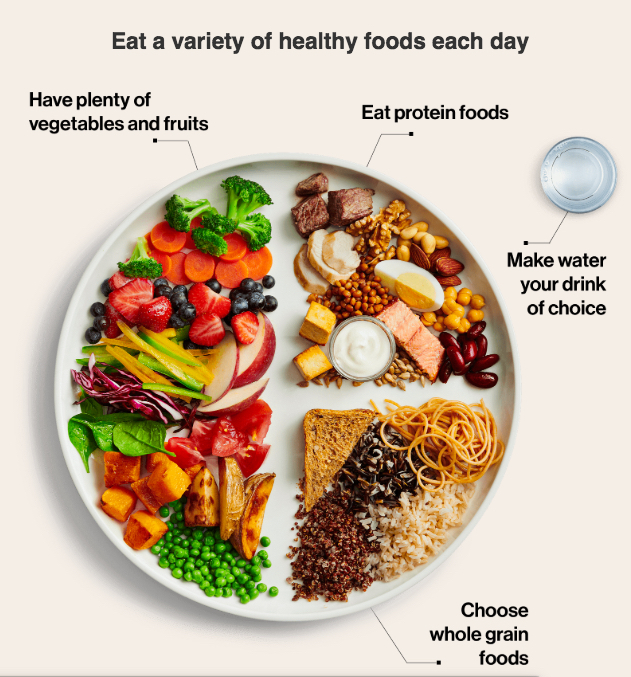 In the plate snapshot, 1/2 the plate is filled with vegetables and fruits; ¼ of the plate is comprised of whole grains; and ¼ of the plate is made up of protein foods. 5. Water is the beverage of choice. To help Canadians stay hydrated without adding calories to the diet, water is recommended. Alcoholic beverages are also flagged as potentially adding calories with little to no nutritive value. The suite of online resources replaces the old “all-in-one” version of the previous Food Guides. More information and recipes are available from Health Canada. Additional consumer resources are expected to be released later this year. Read about my chat with Canada’s Minister of Health, Ginette Petitpas Taylor about the new Food Guide. Dietitians are experts in translating the science of nutrition into practical healthy living messages for Canadians. Contact me for more a presentation or workshop about the new Canada’s Food Guide. Written by: Sue Mah, MHSc, RD, PHEc – Founder & President, Nutrition Solutions Inc.